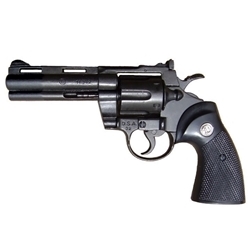 This Magnum Revolver is classic and a must-have for theatrical reenactments! This non-firing model gun has working action but cannot chamber or fire real or blank ammunition. The strong, thick frame design provides a realism found in few replicas. This model functions in both single and double action. The cylinder rotates, but does not swing out. The .357 Magnum is a revolver cartridge created by Elmer Keith, Phillip Sharpe, Winchester, and the firearms manufacturer Smith and Wesson, based upon Smith and Wesson's earlier .38 Special cartridge. The .357 Magnum was developed over a period of time in the early to mid-1930s in a direct response to Colt's .38 Super Automatic. At the time, the .38 Super was the only pistol cartridge capable of defeating automobile cover and the early body armor that was just beginning to emerge in the post World War I "Gangster Era". This is a non-firing copy of the original. This piece replicates the original in size, weight and appearance, and functions much like the original. However, this replica cannot be made to fire or part interchanged. It is the customer's responsibility to check all local laws pertaining to an item before you place your order. We are not responsible for packages confiscated due to Customs inspections. Copyright © SCAleatherarmor.com 2019. All Rights Reserved.